You can not estimate your ammunition’s value solely by its cost in dollars. However you use ammo, whether that might be to assure you’ve an ample supply of venison chili, to keep yourself and your loved ones safe, or just to have great days at the range, you owe it to the stuff to keep it secure and protected. 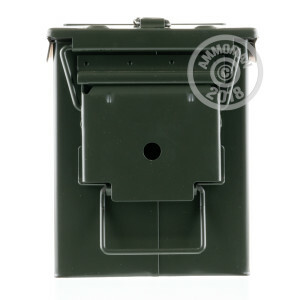 We recommend this mil-spec ammo can for that task. 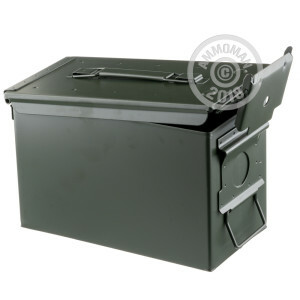 This ammo can is made of rugged steel, and can be dropped, dragged, and otherwise beaten without letting its contents suffer the brunt of that abuse. Its latch seals its lid very tightly, so you needn’t worry about dirt or water corrupting your rounds while they’re in storage or transit. Its handle is similarly durable, so you may dependably lug any number of pounds of ammo to wherever you deem it belongs best. 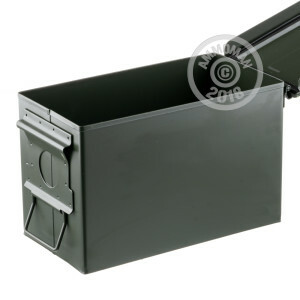 It’s a very voluminous container as well -- although made to contain 50 Cal rounds for the M2A1 heavy machine gun, it would also hold 700 223 Rem/5.56 Nato, 1,000 9mm, or even 3,500 22 LR rounds. Great Cans. Ordered 6. Arrived perfectly packed, 3 to a box. Not a scratch. Clean and every can wrapped in a plastic bag for additional protection. Nice tight seal. Great for storing ammo. Really cleaned up my ammo piles.. Order some silica bags on ebay or amazon to toss in each can for excellent longer term storage. Can't go wrong with these. Best I've seen for the price.